When I left school I took a job as a carding engineer in a local mill. Most mills in the town produced the lambswool and cashmere knitwear that Hawick is famous for. 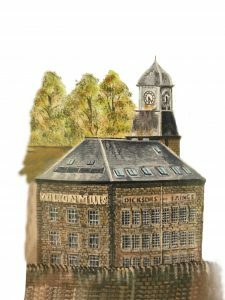 Wilson & Glenny however was a fully vertical Tweed mill, taking scoured wool and carrying out the entire process from fibre to fine quality cloth. Dyeing, Blending, Teasing, Oiling, Carding, Spinning, Winding, Twisting, Warping, Weaving, finishing and mending. The sights, smells and sounds of a mill have always fascinated me. On my first day I was met by the Carding Engineer, Rob Chapman and he showed me round the mill. I wasn’t sure I would stick it, it was noisy, and a bit overwhelming. I have good memories of the mill and its colourful characters and recall being drawn to the rhythm of the various machines. Sadly, like many mills, Wilson and Glenny shut down, but the grounding and training I received there set me up well for the years ahead. Thanks to Ian Landles and Judith Murray who were seeking textile terms and words for The Textile Tower House, museum in Hawick, a line from the song is engraved in the pavement in front of what was the ancient Tower, a very prominent place in the town. I wouldn’t swop it for a star on a Hollywood sidewalk! The mechanical sound you hear on the recording blended in with percussion, is of an actual old weaving loom. The older looms had structure in the rhythm. Nowadays weaving looms are so fast that the rhythm is more like a snare drum roll. A wee reflection of my own past and also reflecting the amazing high-quality knitwear and cloth that is still produced in the town to this day. If the label says “Made in Hawick” you can be assured of the very highest quality. The local people who craft the garments and cloth would never stand for anything less.